After survivng 24 hour Comics Day I do still have the urge to draw. As I relax for a bit and get my mind back into regular mode I decided to do some loose sketching with my Tombo brush markers. 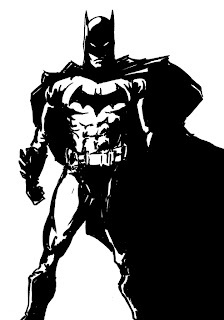 This is just a rough Batman from my sketchbook... nothing special. I believe that the comics we worked on this year will be posted online at some point, and when I get that information I'll post a link.